Site Foreman, Stephen Smyth, opening the door on February 1st. A beautiful bronze sculpture of St. Brigid, donated to Solas Bhride Centre was to be unveiled on St. Brigid’s Day, 2014. Manley Construction Ltd worked tirelessly to have the space ready for the unveiling. However, stormy weather conditions hindered progress. 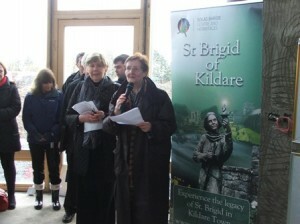 The stormy weather also prevented the arrival of the sculpture because by St. Brigid’s Day, “St. Brigid” was still on the high seas! 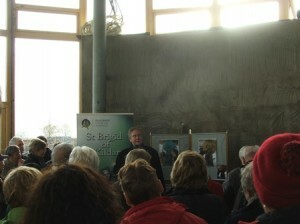 However, a special ceremony was held within the incomplete building, to mark this very generous donation by Fr. Dennis O’Neill of St. Martha’s Parish, Morton Grove, Illinois. Fr. Dennis, together with members of his family and friends, had travelled from the States to be present on the day. They were joined by many Brigidine Sisters, members of the local community, and architect Brian O’Brien of Solearth architecture. Ann Riordan and Rita MinehanCentre. Ann Riordan, MC for the day, reminded all how a year previously, at the Turning of the Sod Ceremony, she had laid down the challenge to Manley Construction to have the site ready for St. Brigid’s Day in 2014. She thanked them for work completed to date and extended the appreciation of all in being able to use the building on the day. 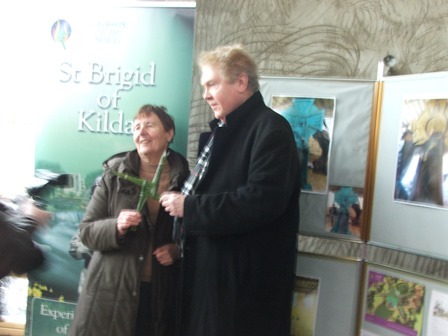 Sr. Rita welcomed each one, while Mary Minehan and Phil O’Shea wove a St. Brigid’s cross giving a brief history of the building as well as remembering the deceased members of the O’Neill Family. Fr. Dennis spoke of his love for St. Brigid and told the story of how he had commissioned Tim Smhalz to sculpt the bronze sculpture. He expressed his delight in finding a “most suitable home” for the sculpture. 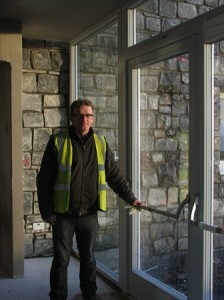 While the sculpture had not arrived he was delighted to view where it would be installed and saw how it will become an important focal point in the new centre. All present had the opportunity to walk around the building. Many remarked on the beauty of the design and the peaceful atmosphere already present there. Following the Ceremony tea and coffee was served for the first time at the Centre by Silken Thomas catering.